At Cape CrossFit our goal is to help you become the best you can be. Of course, training hard plays a helluva important role to do this, but eating well is just as important. You are essentially what you eat - all of you is made up of the nutrients, the minerals, the vitamins you take in through food and liquids so it makes sense then that we want to be eating the best quality food we can find find. Now before you go off on a tangent about quality food being too expensive... when I say "quality" I'm actually referring to food that improves the way you look, feel and perform. Enter the Paleo Diet. If you've done any kind of Googling on "optimal nutrition" or "healthy diet" you would have seen the term "Paleo" pop up all over the place. Also referred to as the "Real Food", "Caveman" or "Wild" diet, the Paleo diet means eating natural, real food with little or no processing - the way nature intended! Over the last few years the Paleo diet has garnered a huge following around the world and is creating what Tim Noakes calls the Real Food Revolution in his new book for one reason only - because it works. The way the majority of the world currently eats is focused on foods that promote convenience, laced with artificial flavor and very little nutrients. Sadly this has resulted in the health epidemic we are currently seeing across the world, with diseases like obesity, type 2 diabetes, cancer, arthritis and more at their all time high. You are essentially what you eat, and the Paleo diet will enable you to become the best you can be. 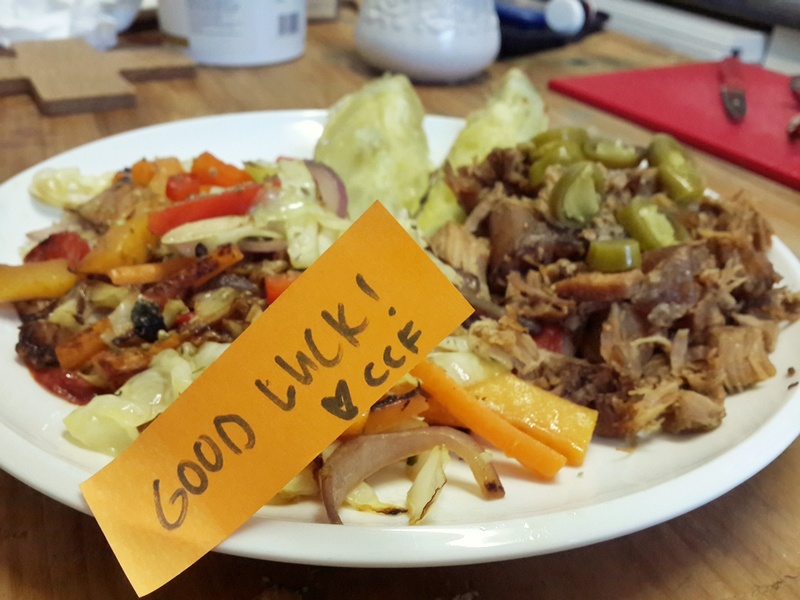 With the "Eat Better" challenge starting today, we hope to encourage all participating to create healthy habits that will set them up for health not only for 2014, but for the rest of their their lives. When starting to make a change to their diet, most people will kick back with questions like "You mean I can't have pizza?" or "Why can't I have sugar and milk in my coffee?". It's only six weeks people, so with this challenge we're encouraging you and holding you accountable for creating healthy habits that will set you up for health for the rest of 2014 and your life. Try for the next 6 weeks to eat as mentioned below, and YOU WILL see and feel incredible changes in the way you look, feel and perform. 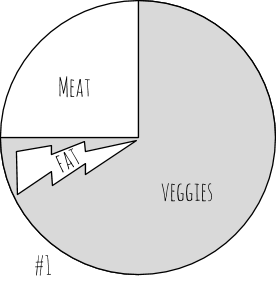 Fill your plate like in the # 1 image: 3/4 with veggies, ¼ with your choice of protein, and a thumb or two of fat. You can have every meal like this. Eat slowly, and eat till you're 80% full. It takes about 20 min for your brain to get the signal of satiety (feeling full)! 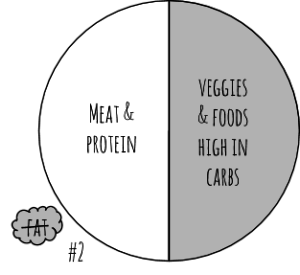 For fat loss - #1 for every meal. For building muscle - # 2 post workout (2-3 hours is fine). Foods high in carbs are fruit (especially banana and tropical), sweet potatoes, white potatoes. Sweet potato hashbrowns with bacon and egg. Salad and protein of choice (steak / chicken / tuna) with olive oil. Braai meat and veg and/or salad. Be careful of Ina Paarman spices or mixed spices - no starch, wheat or sugar! NO JIMMY’S SAUCE. Roast chicken with sweet potatoes / veg and salad. Stir fries are super easy. Grilled chicken with steamed broccoli, cauliflower and carrots topped with butter. Thai green curry with cauliflower mash. Seasonal fruit. Slice them up and add cinnamon. Berries are awesome. I've really found eating out not to be a problem at all for the last 3 years of eating this way. It's actually pretty simple, except of course if you're getting takeaways from Debonaires... I find that most times you'll just need to ask for what you want and the restaurant will be able to provide, even if it's not on the menu. And of course, always skip the chips and bread. Also ask that sauces be brought on the side - you never know what's in them! Steak and salad / veg. You'll find most establishments that sell dinner can do this. This is absolutely a go to option for me. Eisbein is also a favourite, and I'll usually ask for veg instead of the mash with this. Omelettes are always good, choose some veggies, add some extra eggs and bacon and you're good to go. Salads are another option you'll find at most restaurants. I'll usually ask that they add extra protein, and if they don't have that option I'll ask for a burger patty or two on the side. Hudson's is a favourite, order a burger "Guido" style (without the bun) with sweet potato crisps! Always try and eat within 2-3 before of your workout, and then within 45-60 minutes after your WOD. After a hard CrossFit workout your body is primed for nutrient uptake so it's especially important to eat quality food for these meals. Eating before/during/after workouts is a very personal thing, so I usually say that if you like to eat a banana before you workout - keep on doing it. But if you do and you feel full and don't perform well during the wod, then don't. It's really that simple. If your goal is fat/weight loss - keep your meals as #1 under "How Much?". If your goal is muscle / strength gain, eat # 2 post workout. But what about supplements you may be thinking? Supplements are ok to use, provided your diet is dialed in. Because this is a focus, I'd say that the most basic supplement I usually recommend is a good quality whey protein, to increase your protein intake for the day. Omega 3's are another important supplement you must be taking. Preparation is key. Make a big salad or chop stir fry at the beginning of the week. Fav stir fry mix: Red onion, red pepper, butternut, carrots, cabbage and spinach. Julienne appropriate veg and store in fridge in a container. Salad mix: mixed greens, spinach, radishes, bell peppers, cucumbers, carrots, walnuts, almonds and sliced apples or pears. Store in fridge in an airtight container. In the morning, take a serving of salad out of the container, add meat (mince meat, beef slices, chicken, pork) or seafood (tuna, salmon). Toss with olive oil and lemon juice and you are set. Use a slow cooker. This is a device that saves time and can cook up meats for the entire week. For maximum fat loss, limit fruit to 1 - 2 per day. Take Omega 3 pills every single day. Quality is important. Don’t worry about calories. Rather eat slowly and till you’re 80% full. Watch out for mixed spices. My current fav is the Cajun spice by Cape Herb and Spices in PnP. nomnompaleo.com - Awesome recipes and she's started a January jumpstart so will be great to follow! health-bent.com. Awesome recipes and photography.